Peggy Skycraft is a designer of handmade papers but contends that in many ways, we live in a post-paper society. "(Society) doesn't revere and respect paper," said Skycraft, the August featured artist at the Spiral Gallery. She recalled a visit to Chicago, where she noticed a series of easels sitting outside by the trash cans. "They weren't teaching painting, and they weren't teaching drawing. It was all computer stuff," she said. "That's so utterly boring." In spite of these changes, Skycraft continues to find a place in society for her work. 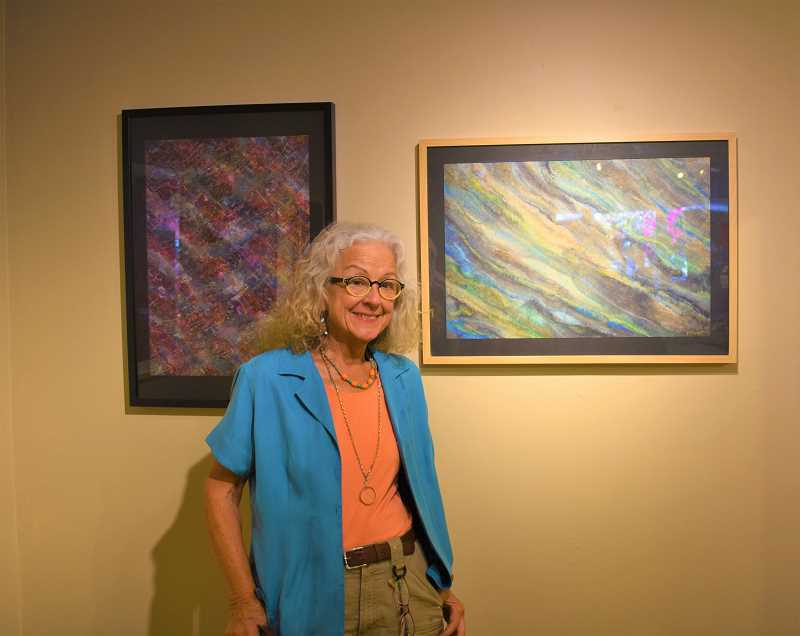 She has been involved with producing decorative papers for more than 40 years, studied at the School of Chicago Art Institute and has a degree in painting from Portland State University. She's created work for bookbinders, framers, interior designers and specialty paper stores. 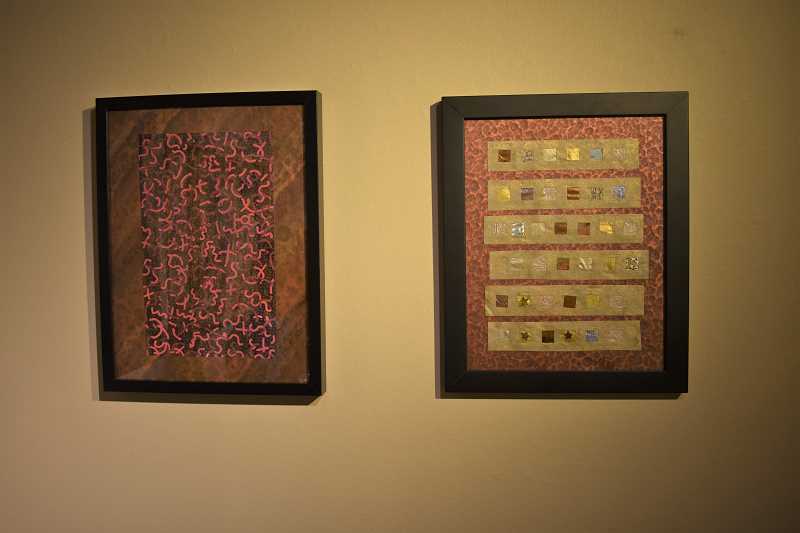 Her show at the gallery at 341 Broadway St., "Surfacing," features paintings and mixed media collages created with her own hand patterned paper and other elements such as joss paper, which is used by several eastern traditions during a funeral to ensure positivity in the afterlife. Skycraft noted that her creation process is always dynamic. "It takes an assortment of techniques for sticking fragile papers together. There are sometimes mistakes to correct or discard. . .but sometimes the magic works," she wrote in a description of the show. "The process is time consuming: visualize some possibilities in design by making little sketches, then think about it until one speaks to me." One of Skycraft's favorite artistic elements is color. She recalled that a friend once gave her a scarf she had admired, and she later realized it was the colors she was drawn to, rather than the piece of clothing itself. There are many stories behind her pieces in "Surfacing." A collage on a black piece of paper with a bright yellow line running through it is a metaphor for lightning "cutting through the trash in your brain." Another collage represents windows in a highrise building of neighbors who don't talk to one another. The show will hang at The Spiral Gallery will hang through the end of this month. Peggy Skycraft's show "Surfacing" will be featured through the end of this month at the Spiral Gallery, 341 Broadway St.